September 22 – 25. BACCO ARTIGIANO. Villa Poggio Reale, Rufina. Thursday 5:30 to 11 pm. Friday 9:30 am – midnight. Saturday and Sunday 9 am – midnight. Free admission. The town of Rufina hosts the 41st annual wine festival celebrating the fall harvest of the Chianti Rufina region. Located in the hills east of Florence, the Chianti Rufina boasts a microclimate with high daytime temperatures and much cooler nights causing the grapes to ripen more slowly producing a high quality, complex wine. This year’s festival commemorates the 300th anniversary of Grand Duke Cosimo de Medici III granting his protection and patronage of the Chianti Rufina wine. Many historical records describe the plentiful Chianti from nearby vineyards served at official state dinners in the numerous Medici palaces. The festival weekend begins Thursday afternoon with the inauguration of an art exhibition. Throughout the festival the town hosts a parade, food stands, wine tastings, children’s events, street performances, music, an antique market and exhibitions in the 16th century Villa Poggio Reale. The celebrations conclude with a fireworks show at 10:30 pm on Sunday. Saturday, September 24. CARRO MATTO (CRAZY CART). Florence historic center. 3:30 to 6 pm. Free. In conjunction with the Bacco Artigiano, the city of Florence pays homage to Chianti Rufina wine. For centuries Florentines traditionally got their wine from the Chianti Rufina region, a custom celebrated today with a festive parade, complete with Renaissance costumed characters, drums, flag throwers and a cannon. Every year on the third Saturday of September the vintners association of Rufina presents their fall bounty to Florence. 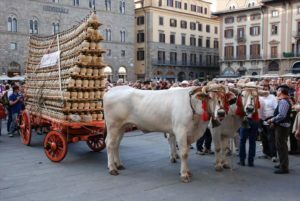 Two thousand fiascos, pear-shaped, straw covered wine bottles, are precariously stacked on a cart in a pyramid and a team of white oxen carries the liquid cargo through the streets of Florence. Rufina, the only town in Tuscany that continues the tradition of creating a giant pyramid of wine flasks, provides a photo opportunity for visitors and residents.